Hey there! I’m Max Rosen, and I’ve been part of the TLC Family of Camps since I was 4 years old. I started out as a camper at North Shore Day Camp and then worked there as a counselor – in total for 15 summers! I have always loved summer camp and working with children and ultimately found my way this past summer to HCDC as a Group Leader for the 1st Grade Boys division. My passion, for the last four years of college study, and a greater part of my adult life working during the summers for the TLC Family of Camps, has resided in working with children. This passion played a major role in my decision to come to Israel with the Yahel Social Change Program, since I would be afforded the opportunity to work in a local elementary school. I am no stranger to working with a large group of children, but nonetheless, I know that things operate differently in different countries, and braced myself accordingly. My experience has actually been quite unique. I work side-by-side with two different teachers, each with their own unique style. When they say, ‘kids will be kids,’ we all know that accounts for a certain amount of leeway, be it their understanding of the world, or in this case, their level of mischievousness! 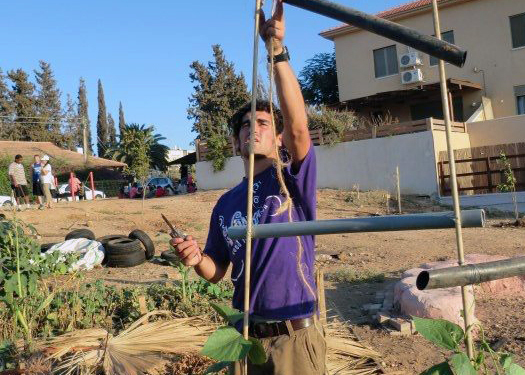 I am still here in Israel with 2 more months to go before my program ends, and what I have found is this unique glimmer of hope – it shines in the people who commit themselves to making a difference in the lives of others, no matter how small it may be. Despite the vast differences in the way each of these teachers choose to educate their students, they somehow manage to harness and channel the seemingly boundless energy into something productive. Not only that, but their commitment has started a chain reaction, providing a future educator with invaluable lessons, a means to reach kids who are afforded so little and give them something they only have one opportunity to receive – an education.